I didn’t think I could love a book more than Truthwitch but Windwitch does it. It manages to top the first book which is such a fantastic thing because you often have that sophomore slump. If you follow Susan on social media outlets you know that the she struggled with writing this story but I saw none of that as a I read. 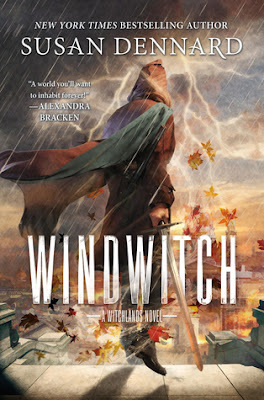 Windwitch is executed beautifully and is an absolute perfect second book for the Witchlands series. One of my favorite things about Windwitch is that it takes all the things you know about the characters and shows you the other side of the coin. Every story has two sides or even more depending on the how many people are involved. You find yourself feeling for characters you didn’t expect and look at characters you love with a side eye. I love love when a story gives me that. Audean and Iseult were my two favorite characters in Truthwitch and continue to be so in Windwitch. I loved every scene they were in, it didn’t matter if they were alone or with other people. They just play off one another so well! I need more! More!! I felt like Safi was sidelined a little bit so we could really get Merik’s story. Not that she didn’t have big parts because she did. I also loved the introduction of Vaness. I hope to see some of the story told in her perspective in future books but Merik needed to grow. Which meant he needed space to grow. He changes so much in this book, some for the better some for the worse. We really see how is relationships with other people have influenced and of course that other side of the coin scenario again. We do get to see Vivia’s perspective and I was ready to hate her. Seeing their story play out I am more intrigued with everyone now instead of hating them. I want to know both “good” guys and “villains” better. The plot pacing was perfect, the world was perfect and the story was addicting. I’m still waiting for the awesome amazing video games and manga based off this series because their needs to be video games and comics for it. Maybe some action figures, legos, funkos…….Oh yes so back to the back. It has my heart as does this series. I can not wait to see what happens next. Great post, love this sharing so much, thank you!